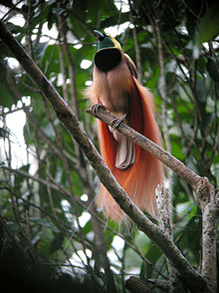 The national bird of Papua New Guinea is the Raggiana Bird of Paradise. It is also known as cenderawasih and kumul. It was named national animal in 1971. The Raggiana Bird of Paradise is found on the Papua New Guinea's flag. The Kumuls' is also the nickname of the country's national rugby league team.